New recipe today! 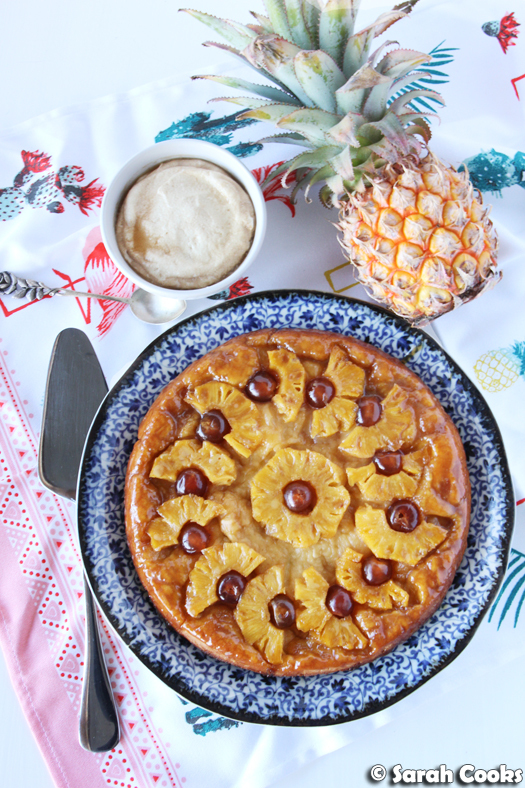 I've got a super pretty and delicious tropical tarte tatin - a gorgeous scone dough topped with slices of fresh pineapple and glacé cherries and an addictive buttery caramel sauce. I served it with a coconut cream for total tropical deliciousness. Last month when Prahran Market asked me to join their A-Team, one of the ingredients they gave me in their mystery bag was mini organic pineapples from Queensland. TOO cute, amirite? They smelled amazing, and I couldn't wait to cook with them! 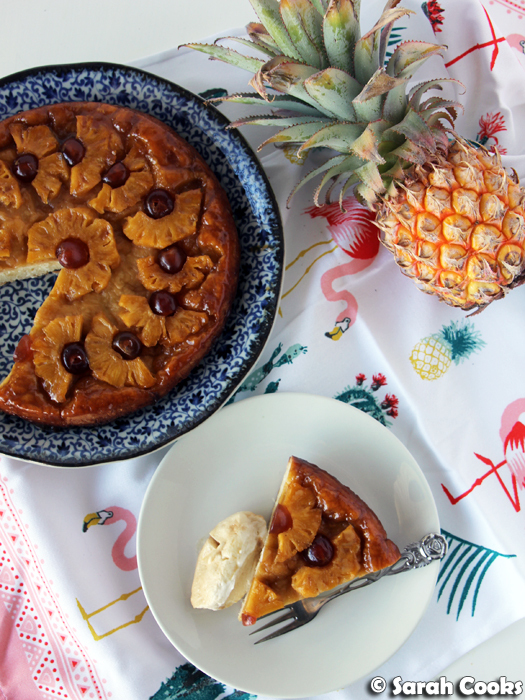 I had quite a few ideas on the brain, but in the end, I couldn't go past an old-fashioned pineapple upside down cake. This is essentially a riff on Nigella's Irish Tarte Tatin from How to Eat (which itself is a riff on Darina Allen's Roscommon Rhubarb Pie). What we've got is a fruity topping, with a scone dough. A traditional pineapple upside down cake is topped with a normal butter cake, but I do like the heft and crunch of a scone dough. To start, I lined the base of the tin with a mixture of butter and light muscovado sugar, and topped it with slices of fresh pineapple and some glacé cherries. During baking the butter-sugar mixture melts and becomes a delicious caramel sauce that soaks into the base. The base is a standard scone dough, with coconut added for texture and general deliciousness, bound together by buttermilk which gives the dough a nice tender bite. The coconut cream - a riff on another Nigella recipe, her Barbados creams - is a mixture of coconut yogurt and regular cream, whipped until thickened and topped with brown sugar, which goes all melty and dissolves into the cream. It has a gentle coconut fragrance and is soooo delicious with the pineapple tart! The tart was fabulous as a dessert, as an afternoon tea and (just quietly), even as breakfast. The crunchy caramelised edges are the BEST. This tarte is best fresh from the oven, but it's still nice a few days later - I'd just suggest heating individual slices in the microwave first. I hope you enjoy it! To make the coconut cream, place the coconut yogurt and cream into a mixing bowl. Whisk until combined and slightly thickened. Spoon the cream into a shallow bowl. Sprinkle over the light muscovado sugar in a thick carpet. Cover the bowl with clingfilm and refrigerate for a few hours or overnight. To make the tart, preheat the oven to 220C. Cream together the softened butter and light muscovado sugar. Spread evenly across the base of a deep 20-cm pie dish with sloping sides. Cut the top and bottom off the pineapple, cutting as straight as possible. Stand the pineapple up, and cut off the skin in strips. Cut out any little eyes with small diagonal cuts. Slice the pineapple crossways into 1 cm rounds. Cut out the central core in each slice. 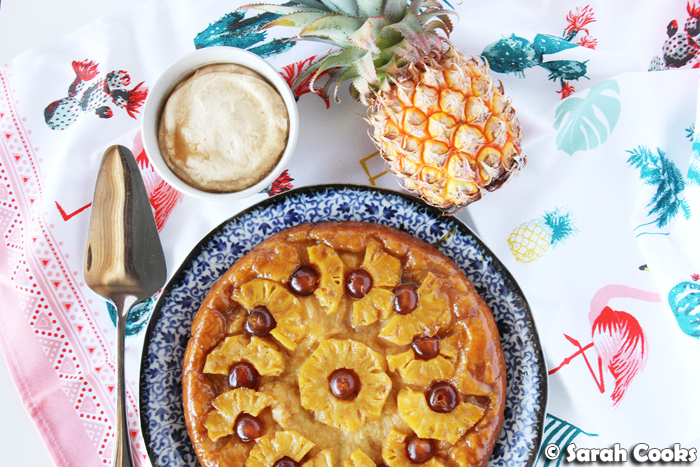 Arrange the pineapple slices and glacé cherries in the base of the pie dish. Sieve the flour, caster sugar and baking powder into a mixing bowl. Add the butter and rub into the four until the butter is evenly distributed and mixture resembles coarse breadcrumbs. Stir in the shredded coconut. Pour the buttermilk into a measuring jug and whisk in the egg. Make a well in the centre of the dry ingredients, pour in the liquid all at once and stir in gently to form a soft dough. Turn out onto a floured surface and pat and roll the dough into a circle about 2.5 centimetres thick. 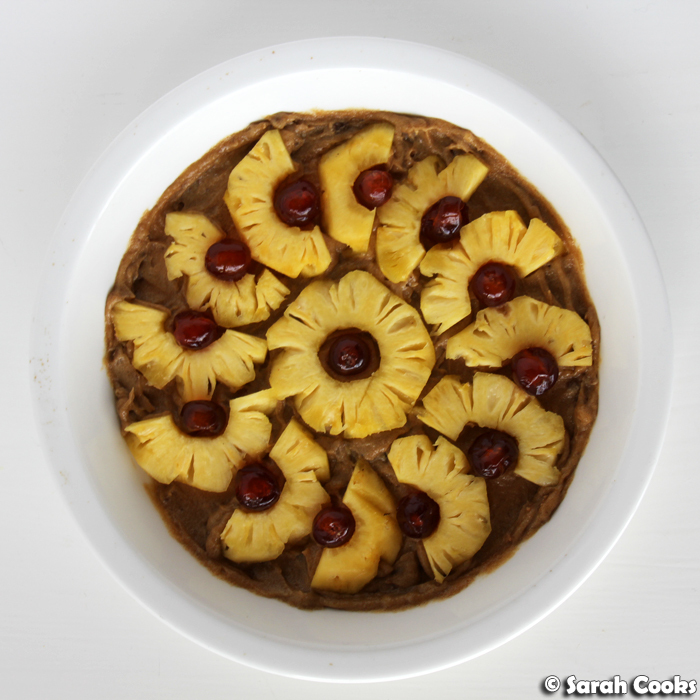 Place the disc over the pineapple and tuck in the edges as neatly as you can. Brush the dough with either condensed milk, or a little beaten egg and granulated sugar. Place the pie dish on a baking tray (to catch any sticky drips) and place into the oven. Cook for 15 minutes, then turn the oven down to 180C and cook for a further 30 minutes, or until the top is crusty and brown and the dough is cooked. You may need to cover the pie with foil halfway through if it is browning too quickly. Allow the tart to cool for 10 minutes, then gently loosen the edges with a butter knife. Place a serving plate over the top of the pan, and, with oven mitts and confidence, turn it upside down so that the pie comes out onto the plate with some caramelly liquid. Serve the tart warm, with the coconut cream. Ooh I was hoping it was pineapple. 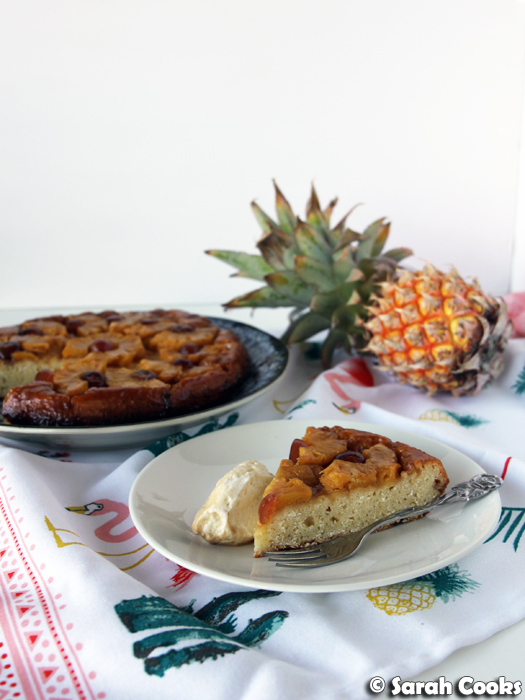 I've had a gorgeous pineapple upside down cake in Hawaii and I've wanted to make one like it ever since.